Innovation doesn’t grow in the comfort zone. It takes courage to breathe life into a new idea. But there’s a common belief that entrepreneurs are born, not made. At MIT, we know that this is a myth. MIT graduates have started over 30,200 active companies that generate over $1.9 trillion in annual revenue and employ roughly 4.6 million people, making MIT the 10th largest economy in the world. And in just three years of the residential MIT Bootcamps, its graduates have raised over $70 million in funding for ventures incubated in the Bootcamps. Entrepreneurship can be taught. The journey starts with knowledge, not genetics. So in this online Bootcamp you will develop a systematic toolkit for venture creation and gain a disciplined mindset of the successful entrepreneur. 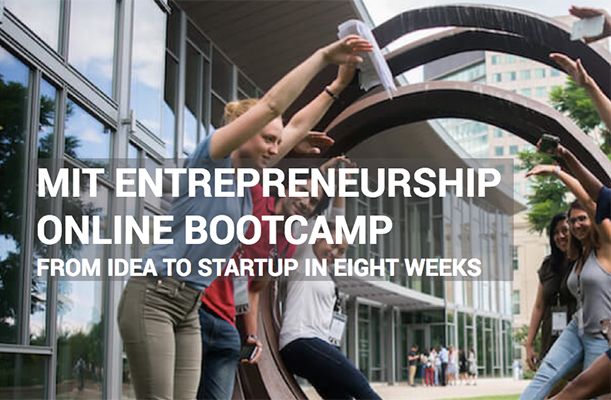 Enroll today in the MIT Entrepreneurship Online Bootcamp where you will learn and practice a variety of new skills related to entrepreneurship and innovation from MIT faculty, MIT startup coaches, and guest speakers. Duration: 8 weeks, online. 8–10 hours per week. Early applications are encouraged. Spots fill up quickly! To learn more and to download a brochure, visit the program website.